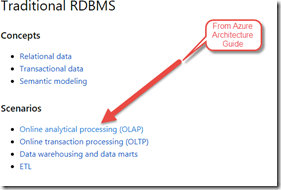 After reviewing Azure Data Architecture Guide, I noticed the label Online Analytical Database (OLAP) referenced as the description for Azure Analysis Services. I will call Azure Analysis Services AAS from here on. The AAS is using tabular models and not multidimensional cubes. Lately, OLAP has not been seen as an overall description of the tabular model. There were references to semantic model replacing cube’s data source view. It is good to see this in official Microsoft documentation. While recording or speaking, we do not have to skirt around this tabular versus cube and now just call both OLAP. I had been calling it Analytical Database or Analysis Service database. Most of the work I do is still on premise, but I see more and more people talking about the Azure. So, I believe it is time to consider this option with most work we do. Mellissa Coates (@sqlchick) seems to be doing a lot of presentations, workshops and articles around this topic. She has some really good stuff about on premise SSIS as well on her site. There are still some challenges to Azure DW, but Microsoft seems to be listening to client and working to improve. I find it good that they list the challenges in the document.